Oumar Niasse has been superb today. Running in behind, keeping hold of possession. The Everton loanee holds the ball up well to start another Cardiff attack. Watched a team earlier who could do with a centre forward with those traits… they lost 3-1 at home. Bobby Decordova-Reid’s second goal of the evening means he has doubled his tally for the season. And more importantly for Neil Warnock, Cardiff have a two-goal lead for only the second time in 2018-19. They beat Fulham 4-2 on the other occasion. Can they hold on for another much-needed win here? Bournemouth clear the danger and then hang on from a tricky corner too. Cardiff pressing for a third. Yellow card fever is spreading… Nathaniel Clyne joins Bamba in the book after bringing down Josh Murphy. Free-kick in a dangerous position for Cardiff. Clumsy from Sol Bamba on Joshua King. A yellow card for his troubles. Long way back for Bournemouth now. Eddie Howe’s side need a quick response. Ryan Fraser tries to muster one from outside the box, but blasts over. It’s great movement from Bobby Reid. He was tight, maybe a yard or two on, but he times it to perfection, composes himself and passes it into the net. Just 15 seconds into the second half andBobby Reidlatches on to a hopeful Aron Gunnarsson ball to round the goalkeeper and prod home with his left foot. Neil Warnock wasn’t even back out of the changing rooms yet! Eddie Howe will not be happy, for his team trail despite dominating possession. But Neil Warnock’s half-time tea must taste sweet. After all, Cardiff lead at the break for the first time in any game this season. Bournemouth dominating possession, but possession alone doesn’t win ya games… right? 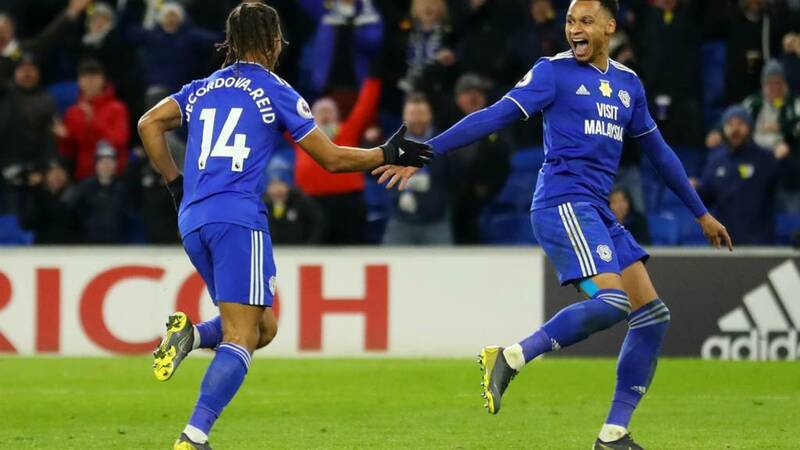 So that Bobby Reid penalty was Cardiff’s first home goal in three Premier League games. Ash Williams:Any Liverpool fans wishing Clyne wasn’t allowed to go on loan, look at him tonight. He’s looked average at best. Cardiff lead thanks to that early Bobby Reid penalty. Better from Joshua King, wriggling his way into the area before seeing his attempted cross booted away. Not seen too much from the Bournemouth front two so far. Might’ve been a shout for a penalty amid a scramble in the box that followed, too. Dominic Solanke caught Callum Paterson on the ankle as he went to clear from a corner. Cardiff go steaming forward again and Josh Murphy whips a wonderful ball across the top of the six-yard box. Callum Paterson is waiting to tap it in at the back post but it’s a superb tackle from Adam Smith to take it behind. Bournemouth’s passing has been slick, until the last third when they try to find a way through the Cardiff defence – all well and good moving it smartly in front of a wall of blue shirts.